Applications of body-fitted coordinates in transport processes: Numerical computation and physical interpretation (W. Shyy). 2. Binary solid-liquid phase change with fluid flow (P.J. Prescott, F.P. Incropera). 3. Essential aspects of floc structure and breakage (S.X. Liu, L.A. Glasgow). 4. Interaction of macro- and micromixing in agitated reactors (V.V. Ranade). 5. Macrosopic modeling of dynamical phenomena in liquid crystalline materials (A.D. Rey). 6. Mathematical modeling of intracrystalline diffusion in zeolites (V.S. Patwardhan). 7. Mathematical modeling of web drying (M.J. Lampinen, K.T. Ojala). 8. Transport of gases containing condensables in porous solids (S.K. Bhatia). 9. Devolatization of polymers (G. Astarita, P.L. Maffettone). 10. Bubble growth and collapse in viscoelastic liquids in tranport phenomena in chemical processes (S.G. Advani). 11. Transport processes in particulate systems with non-Newtonian fluids (R.P. Chhabra). The subject matter covered in this volume covers a wide scope. It contains critical reviews in many frontier areas of interest to engineers and applied scientists. Multiphase transport ranging from floc breakage to flow through multiphase media is discussed. Difficult problems of bubble growth and devolatilisation from polymeric melts are treated. The question of solid-liquid phase change with flow is considered and the emerging quantitation of web drying technology through mathematical modeling is covered. Transport phenomena in high-tech materials ranging from zeolite catalysts to liquid crystalline materials are covered and formidable problems of transport of gases in porous media, which have implications in many different technologies, are also addressed. 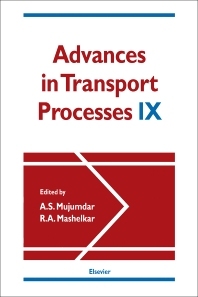 Finally, applications of newer techniques in numerical computation of transport processes are highlighted. These authorative, evaluative and timely reviews of topics of current and potential interest will serve the needs of practising engineers as well as academic and industrial researchers.